Whether you’re enjoying the tranquility and serenity of a calm, low-splash indoor waterfall or you’re daydreaming in front of a spectacular rushing fountain outdoors, only one thing could make it better: the perfect lighting. The problem? It’s tough to choose the right LED lights for a waterfall. There are so many factors to consider, so we’ve taken all the guesswork out of it for you. 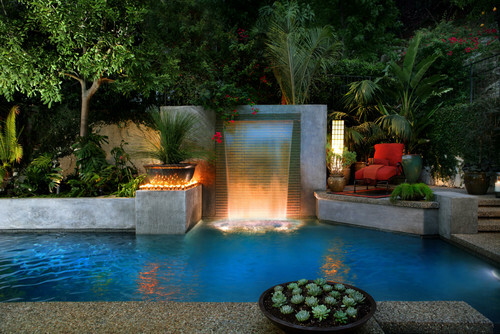 Lighting a waterfall with LEDs creates a gorgeous end-result, but finding compatible lights is the hard part. Generally, the biggest challenge is finding something that conforms to the contours of your fountain without compromising style or function. You don’t necessarily have to illuminate the water from the inside (although we’ll touch on that later), but creating a breathtaking glow beneath rocks or along ledges is a great way to create a perfectly finished look. If your goal is to create a stunning display, outlining features of your waterfall is a must. Most people opt for flexible neon LED lights, which are weather-resistant, extremely flexible, and remarkably bright. When placed beneath rocks, between pieces of wood or behind waterfall spray (but not in the water), flex neon lends itself to a halo effect; a soft, lingering glow that creates spellbinding depth. Flexible neon is the premier choice of outdoor decorators and landscapers because it offers all the benefits of glass neon without the risks. Because it’s unbreakable, you can twist, wind and coil it to create virtually any shape, and it’s rated for an extremely long life span. Flex neon is also easy to install beneath ledges, so it’s ideal for creating edge lighting to highlight pools and other features. 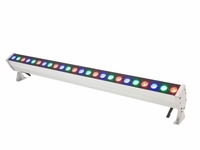 Our comprehensive collection of flexible neon LED lights includes several colors, so you can create the perfect single- or multi-colored display, using both line voltage and low voltage waterfall lights. When you want to enjoy backlit froth, bubbles and water flow, lighting your waterfall from beneath the surface of the water is the way to go. 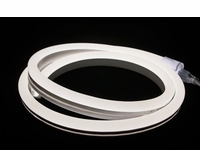 Linear tape light products with the most innovative technology, such as the Trulux Submersible LED tape lights and StarStrand Rainbow Aqua Star tape lights, are fully submersible, IP68 rated and covered with a chemical-resistant, UV-resistant plastic cover. 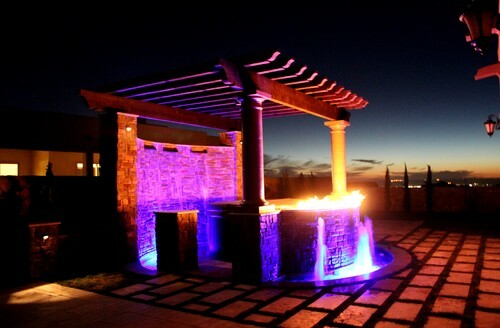 With a color controller, you can create spectacular waterfall lighting effects. The primary method used by most contractors for underwater waterfall, pool, and fountain lighting is submersible spot lights. Submersible white spot lights, such as those from Focus Industries, are a fantastic choice to brightly illuminate flowing water. 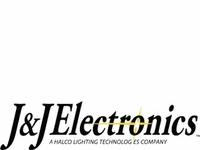 For color-changing spot lights, professional underwater RGB spot lights from J&J Electronics will give your water feature an unmatched look that will be the envy of all. Choosing submersible and powerful underwater spotlights will create the unmistakable look of water brightly glowing from within. It is often difficult to predict exactly what kind of waterfall lighting effect you will get with each position of the lights, so you may need to experiment with the LED fixtures. If you want to create waterfall lighting that highlights the movement of the water, your lights should be aimed precisely where the falling water hits the pond’s horizontal surface. In this way, the light will illuminate the air bubbles. Because water bends light, it may take some trial and error with submersible lights to highlight a structure or statue. If your waterfall pond is home to aquatic life, be sure to leave an area that’s dark and quiet, as a healthy environment for your fish. This can be a far corner, cave, decorative structure or even a collection of stones underneath a walkway. Few things compare to a beautiful splash of lighting washing over running water. LED wall wash fixtures can bring that vision to life. We have warm white and RGB linear wall washers so that you have several choices. Wall wash fixtures can be used to illuminate the running water from outside the water and to cast light on surrounding rocks and features. 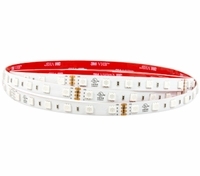 Whether you choose white lights or multi-color RGB depends on your personal preferences. While white alone creates a beautiful display, RGB gives you the freedom to choose which colors to display and when to display them. Weighing the costs (in most cases, RGB costs a bit more than plain white) against the benefits, such as the versatility and flexibility of colored lights, can be a deciding factor for some people. Contact us today and let us assemble a custom quote for submersible LED lighting fixtures for your waterfall project.